Hospitality in the Park was very highly anticipated amongst fans, with an incredible line up boasting some of the finest drum & bass DJs across the globe, so being able to cover it for Cub Magazine felt a bit like winning first prize in a competition. As coincidental as it sounds, the day before I was contacted to review the festival I had been telling my friend about how much I wanted to go and was sad to be missing out. So when I was emailed and offered press passes, I couldn’t quite believe my luck. I had friends who were already going and was ecstatic to be able to join them. As the festival took place in London’s much loved Finsbury Park, it was miles easier to get to than the usual trek to the countryside most festivals entail. From Queen Mary’s campus it took us less than half an hour to arrive at Finsbury Park’s gates. The first thing I have to commend Hospitality in the Park for is the friendliness of the staff. Going through security at the entrance is never a fun experience and as all festival-goers will know, it can be very invasive. I’ve never really had a “nice” experience with security but I actually had a laugh with the member of staff who searched me. Each person I spoke to was friendly, in a great mood and didn’t let the bad weather knock their spirits. So hats off to them. Hospitality really made great use of all the space available. Finsbury Park is not the biggest park in London by far but still managed to comfortably fit seven stages, a seating area and plenty of bars, all whilst still feeling open and away from the city atmosphere. Although the layout was slightly confusing (there was either too little signage or we were a tad too tipsy to tell), we found our way to each tent with the aid of helpful staff. The only slight problem with travelling between tents was the state of the ground by mid-afternoon; the rain had really kicked in and turned Finsbury Park into a swamp. Of course we didn’t let this ruin the day, even if I did fall over and get mud all over my new jeans. Each tent offered something unique and had its own particular atmosphere, making you feel a part of an intimate set separated from the rest of the festival. The Outlook tent was bright, open and lightly coloured to reflect the Croatian vibes from which Outlook festival originates, which was a stark difference to Med School XL’s darkly lit, low ceilinged tent which was accessed through what seemed like an abandoned hospital. 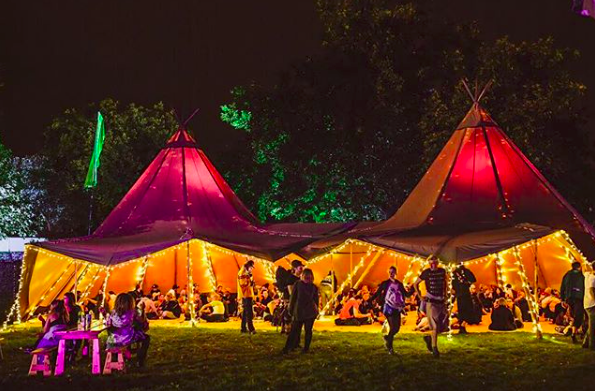 Both tents managed to transform the festival into its own particular genre which really emphasized the different spectrums that drum & bass can reach. Hospitality really mastered balancing each sub-genre of drum & bass across the festival. Etherwood’s dark liquid drum and bass was somewhat magical in the intimate atmosphere of Med School XL, whereas Goldie’s headlining set in Outlook felt like an energised beach party. The choppy jump-up in Run-Vaderz was heightened by the intimacy of the small tent, making it feel hyped and busy yet not overcrowded. The size and volume of Hospitality’s self-titled tent really reflected the grandeur of the acts it hosted, with the likes of High Contrast and S.P.Y playing stellar sets. Overall, Hospitality in the Park was a day I was thrilled to be a part of. With such an incredible line up catering to all sub-genres, it really is a festival which drum n bass fans can’t miss. Hospitality have really pulled off hosting the UK’s biggest drum n bass celebration for a third year running, and I really can’t wait to see it get even bigger and better next year. I just hope there’s a bit less mud! ← Exclusive Review of ‘A Simple Favour’ & ‘The House with a Clock in Its Walls’.